Our client grew to a head-spinning degree in a very short period of time, in all the best ways. To create a firm foundation for leaders to excel and flourish through growth, Ascension Ministry Service Center (MSC) invested in coaching. The goal was to make leaders sharply self-aware of their own leadership styles, to prevent silos in the organization through multidisciplinary teams, and spark an understanding in accountability and ownership in overall goals. The impact was so great from FlashPoint’s initial coaching engagements with the two leadership teams in 2013 and 2014, the MSC decided to mature the process even further. The next step, in 2015, was to invite four levels of leaders to participate in individual and group coaching: executive team, operations leadership team, directors, and managers. Investing in more coaching—more frequently and deeper down into the organization—has been the vehicle to reach their business goals through growth and change. When every level of leader is performing at his or her very best, an organization is positioned to perform at its best. The MSC is a provider of HR, supply chain, and financial services to Ascension, the nation's largest nonprofit health system. The MSC’s support is vital as Ascension strives to lower healthcare costs and improve services at more than 1,900 health service sites across the country as well as be positioned to offer services to sites outside the network. 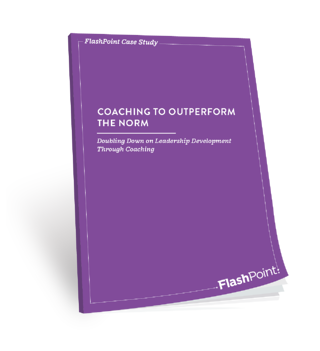 FlashPoint designed and facilitated a coaching program customized to the organization’s unique needs and structure. The program propelled leaders to create a culture of coaching where multiple levels of leaders give and receive feedback through exercising courage and compassion. 360-degree assessment: To measure progress, participants take an LPI®: Leadership Practices Inventory® assessment at the beginning and end of the year-long series of coaching sessions. The inventory opens the participants’ eyes to the things they are doing well as leaders and specific actions they can take to grow based on their insights. Individual development plan (IDP): The IDP is a tool to guide each person’s path toward achieving his or her leadership development goals. Participants incorporate assessment results, personal focus areas, challenges, and strengths. Individual coaching sessions: Personal attention from a coach helps each person set goals, apply 360-degree assessment results, commit to opportunities for growth, and remain passionate about achieving their goals. Group coaching sessions: Grouping leaders with their peers gives participants insight into how each role fits into the context of the whole. Leaders realize they aren’t isolated and in fact share common challenges, which drives a more fruitful coaching experience, matures the operation, and drives continual improvement. Leadership training sessions: These practical and hands-on sessions present a deep-dive on the 360-degree assessment and share specific ways to translate assessment results into effective action. 100% of participants responded favorably that the 360-degree LPI assessment was a useful tool to help gain self-awareness. 94% of participants said they worked to apply the skills they learned throughout the coaching process to their jobs. Over 80% of all participants have made significant progress on goals that improve performance in leadership. In 2013, the MSC started with six months of coaching with two groups of leaders. In 2014 they increased their coaching engagement to area leads, and in 2015 they matured the process even further and invited four levels of leaders to participate: executive team, operations leadership team, directors, and managers. Realizing more value in increasing the duration and depth of coaching, our client has made a long-term strategic investment with an expanded coaching plan on the horizon for 2016-17, in order to grow leaders, create a leadership pipeline, and cultivate a sustainable culture of leadership that allows this growing company to succeed.